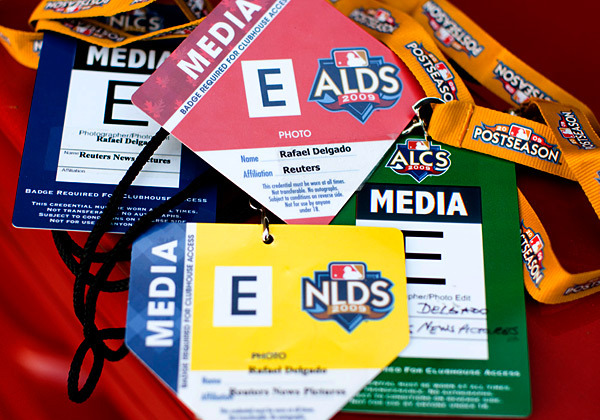 Rafael Agustin Delgado's golden tickets for the 2009 MLB Post Season here in Southern California. The recent MLB playoffs here in Southern California were short, but still a memorable experience. I did not have one photo published, or a single byline however the experience was a wonderful time for me. I cherished each game as Reuters' on site photo editor. My specific role was to make sure the Paneikon software moves smoothly for 8 out of the 9 local postseason games. Flawlessly operation makes for a great day when stationed in the photo room. There were only two items of concern during the games. One game 3 cards came back blanked. Not a good situation at all. A faulty card reader was the issue at hand and solved once replaced. The other event occurred when the Dodgers in house Internet went down. The cards sat idle and all I can think of at the time was at least the other wires were off line as well. Option B, using sprint cards were about to be utilized however the new router was installed by the stadium engineers. The cards went out for further edit with little drama and I was a happy camper. Paneikon, is the software program that allows Reuters editing workflow distributed around the world. Whoever is login on are able to work remotely but together at the same time. 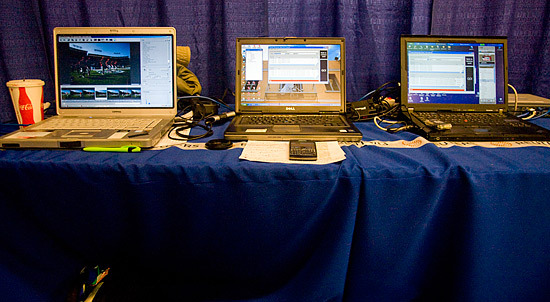 Any Internet connection keeps the post-production a team effort and stream lined. Hard line connections are always the prefer method, but a sprint card works as well. In short, one hits go, waits for the upload to the hard drive, which simultaneously makes a contact sheet. When a user makes a selection, they can pull the desire cropped photo only. This saves bandwidth and more importantly time. The photo then goes for final captioning, toning, sharpening, and then up for publication. The quicker photos appear on the market, the easier it is to sell and distribute. Speed and ease of transmitting photos is everything for a wire service, and is the sole reason why I am on scene. I am logistical personnel, and enjoy the role for a few reasons. Photographers can focus on shooting the game and not miss a play, when I am onsite taking care of the cards. Knowing when and what to shoot is easy to distinguish when you hear several shutters go off in unison. When located in the photo room at my array of laptops, I am able to experience the editing room. What is demanded from the photographers? What editors like, and of course what they rather not waste their time. Best Spot Ever! Rafael Agustin Delgado stands on the Dodgers Batter Circle after The Dodgers beat the Cardinals of game 1 of the NLDS. They eventually would sweep the series later to lose to the Phillies in 5 games. My position is usually nowhere near the field of play during game time. It is usually a room with a field of empty Think Tank Photo roller bags, laptops arranged throughout the room and a network feed of the game with a 10-15 second delay and I love the role. My game experiences may be stole away in a bunker room buts its my favorite room in the stadium. From this perspective I see the photos that make it to publication, and the images left idle on a hard drive never to be seen again. Seeing an image full frame and then the cropped applied is always interesting. The best of course is seeing who is having a good day shooting, and who eventually gets the shot of the game. There is no photojournalism class that will prepare you like on site training and experience. I went from dealing with a weekly deadline at my college paper, to dealing with several time zones deadlines, once I started working for Reuters. My byline has yet to become regular however one day I look forward to that changing. I am a much more informed photographer today than I was just a year ago because of experiences behind the scenes, like the recent 2009 MLB post season. I look forward to future events down the line, like maybe the Dodgers' winning the pennant finally. Until then I would like to thank the MLB photo runners like Jeff Ball, a fellow Sports Shooter member and Sports Shooter Academy VI alum, for making my job easier. This role at times was mundane but it allowed me on site this 2009 MLB post season. It would have been 9 games. However on Oct 13th the Dodgers and Angels played at conflicting times against my will. Each game, I made it a point to arrive with time to spare. Batting practice from the field was my priority. The sound of corked practiced bats launching helpless baseballs into the outfield bleachers is always a blast. A catcher's mitt collapsing around an incoming fastball is just a wonderful sight and sound. I can see why people find baseball a bore, but to me, each pitch is amazing. It is a game of history and numbers, and the reason why I love this past time. 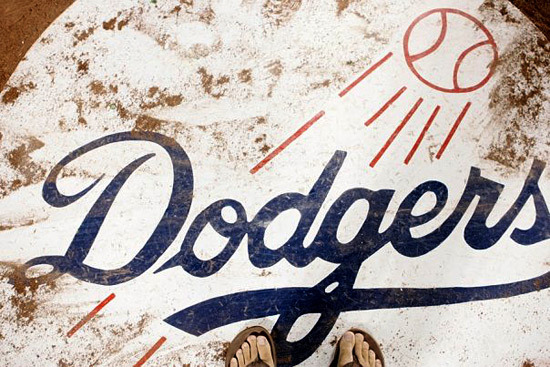 Unfortunately for my beloved Dodger's their post season was short with the aide of the Phillies. A .194 batting average with runners in scoring position sealed my team's fate this past 2009 NLCS. At least for my mother, her Yankees went all the way this year. Delgado's view and position inside the Dodger's photo dungeon room at Chavez Ravine. A few hours each game I was fixed at several laptop machines. However once the job was completed, I simply enjoyed the games. Doors that were usually closed opened wide thanks to the golden ticket around my neck. Angel Stadium is now just a short drive down Katella Ave. for me. It was strange to be surrounded by so much red but the apple pearls from the media food was simply amazing and delicious. Dodgers Stadium, the home to my beloved team, is a mere 8 miles away from my hometown of Pasadena. The days long before my beard came to the scene, I played in the same little league as Orel Hershiser's son. I even graduated in the same high school class with one of Fernando Venezuela's son. Unfortunately I also played football with the same son, who was much bigger than me, and I am 6'2' 280lbs. Inside Vin Scully's Press box, I waited for the mass array of brake lights to clear. As the writers finished their stories, I sat idle taking in the setting with a Dodger Dog . The last game, I was even lucky enough to see Tommy Lasorda interacting with the stadium crew. His Spanish was not the most eloquent, but it worked. He even signed a few autographs and took a few photos for his fans. I could not think of a better place to be for this Dodger fan.